"TOM HORN - RANGE DETECTIVE"
Tom Horn was born in Missouri on November 21, 1860. At the age of fourteen, he made his way west through Kansas City and Santa Fe to Prescott, Arizona where he was hired by Al Sieber as an Army Scout, and was influential in the surrender of Geronimo in 1886. After the Apache wars, Tom worked as a cowboy and deputy in Arizona and in 1892 became a Pinkerton Agent in Denver, Colorado. In 1894 he was hired by the Swan Land and Cattle Company of Wyoming to work undercover with the Wyoming Cattlemen's Association to eliminate rustling which had become wide spread throughout the state. A task that he was well suited for and perhaps performed too well. In 1901 Tom Horn was arrested, convicted and ultimately hanged on November 20, 1903 for the dubious murder of a fourteen year old. This series of events surrounding the legend of Tom Horn has left, for the State of Wyoming, a cloud of controversy that persists to this day. Exclusive issue of only 250 signed and numbered artist's prints at $250.00 each. Image size - 18" X 24". 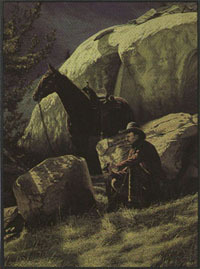 This painting was used on the cover of the book "Tom Horn - Killing Men is My Speciality..." by Chip Carlson.